Vito cdi model. 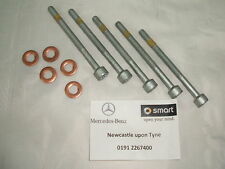 set of 4 genuine injector bolts with 4 injector seals. 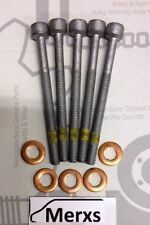 genuine torque head stretch bolts with lock tight paste. it is your responsibility to ensure you are purchasing the correct part number that matches your old one. OM651 fuel line leak off for injectors. Sprinter W906 2010 - 2017years. 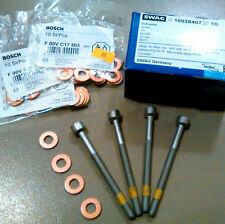 Set of 5 genuine injector bolts with 5 injector seals. 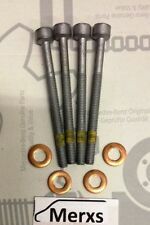 genuine torque head stretch bolts with lock tight paste. various models. it is your responsibility to ensure you are purchasing the correct part number that matches your old one. Om602 sprinter 310d 410d 312d 412dfrom turbo diesel 5 cylinder. The Part imaged and described is th eactual part you will recieve. 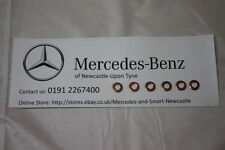 Require different parts from this Particular vehicle?. The Vehicle details from which this part was removed are as follows :-. Style Saloon. Models to fit- Certain 220 CDI models, aprox 1999-2003 years. (Vi) As A Result Of Overheating Or Lack Of Lubrication (Due To Insufficient Coolant Or Lubricant). V) As A Result Of Fire Or Theft Or A Collision. Refers To The Cylinder Head & Block And The Components Which Make These Up (I.E. Pistons, Cam Shafts, Con Rods, Etc). FUEL RAIL WITH INJECTORS A1120700595. We cannot be held responsible if the item does not fit your vehicle. Suitable For Selected OM611 Diesel Engines. 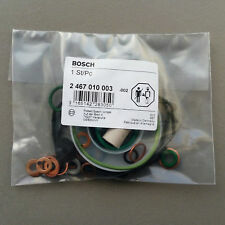 PART NUMBER R9144Z240A. FUEL RAIL WITH SENSOR. IF THERE IS A PART YOU ARE LOOKING FOR AND YOU CAN NOT FIND IT. (Other Details: 219 Series 04-10. 2 Pin Plug. 3.0 Diesel. 219 Series. AB30-38, AB44-56, FK17-99, G83, IV1-28, IV30-39, IV52-54, IV63, KW1-14, PA21-33, PA34-40, PH18-26, PH30, PH31-41, PH49-50. Jersey, Guernsey, Scilly Isles) as well as for the Scottish Highlands. Model: s320. Engine: 3.0 v6. Fuel type: Diesel. Year: 2009. 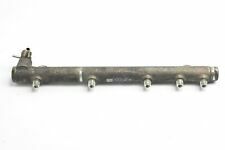 MERCEDES HIGH PRESSURE FUEL INJECTION RAIL PRESSURE SENSOR A6420703395-001. Condition is Used. Dispatched with Royal Mail 1st Class. OS is offside, right, or drivers side in the UK. CURRENTLY BREAKING COMPLETE VEHICLE. PART NUMBER -. NS is Nearside, Left, or the passenger side in the UK. We won’t take any responsibility for the compatibility of parts unless we have explicitly said it will fit. Come from running engine full working order. Please before ordered check your part number. Tnx for looking. NOTE:PART IS LOCATED BETWEEN INJECTOR AND LEAK OIL LINE. 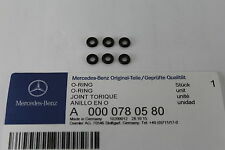 Models to fit- Certain w210 e320cdi's aprox 1999-2002. Price if for 1 plug, all 9 pictured to show condition. Removed from the car below but may fit other models/years. Donor Vehicle Details. We have a lovely team of people who will always get back to you within 24 hours. Model: s320. Engine: 3.0 v6. Colour: Silver C775. Fuel type: Diesel. Item Specifics:1996-2005 - W168 - 1.4 PETROL - INJECTION RAIL - PART NO 96614003 - A1660700895 - 2 2 2 2 PIN PLUG. Part:Injection Rail. This Injection Rail was removed from a2002 car and has been fully inspected. Models to fit- 280/320 M104 engines, approx 1993-1997 years. A full fitting service is available if required. Any claims after 24 hours will be dismissed for a claim. At Tori Auto Services, We specialise in all makes and models Parts and repair Services. Compatibility?. Part Number: 1300780341. Fuel Injector Rail. Isle Of Whight - PO30-41. Arran - KA27 KA25. Oban - PH 33, PA20-49, PA60-80, KA28. Orkney and Shetland - Orkney KW15-17 and Shetland ZE1-3. 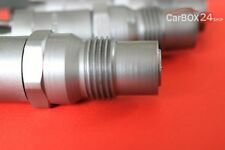 2.7 DIESEL INJECTOR FUEL FEED RAIL LINE. FITS OTHERS W209 CLK 270 CDI 2002-09. JEEP GRAND CHEROKEE 2.7 DIESEL 1999-04. OPENING HOURS PART NUMBER:A6120700295 / 0445215021. Based inWest Yorkshire, Dewsbury our motto is to provide 'Service Excellence as Standard'. All our goods are marked for security purpose. FITTING SERVICE AVAILABLE.